Only those who arrange an appointment at the reception desk at the entrance of the exhibition „Reality … is more absurd than any film“ are invited into the therapy room to put on the virtual-reality glasses. Over the next fifteen minutes Omer Fast narrates a modern Chinese fairytale and allows the spectators to immerse themselves in a strange, magical world. I was able to ask him five questions about his work. The film „The Invisible Hand“ is based on an old Jewish fairytale. Did you grow up with these stories, and do you associate certain memories with them? No. I grew up in a secular home with very young parents who observed practically no traditions and grandparents who didn’t talk about the past. The idea of a missing heritage, an absent past or a repressed past is very central to my work. „The Invisible Hand“ is about the reappearance of a buried past and the punishment it inflicts on a family that tries to reject it. The film is being shown at the Marta Herford in a clinical setting. Visitors find themselves in a waiting room and are asked to complete a medical questionnaire, after which they receive an appointment for their exclusive „treatment“. 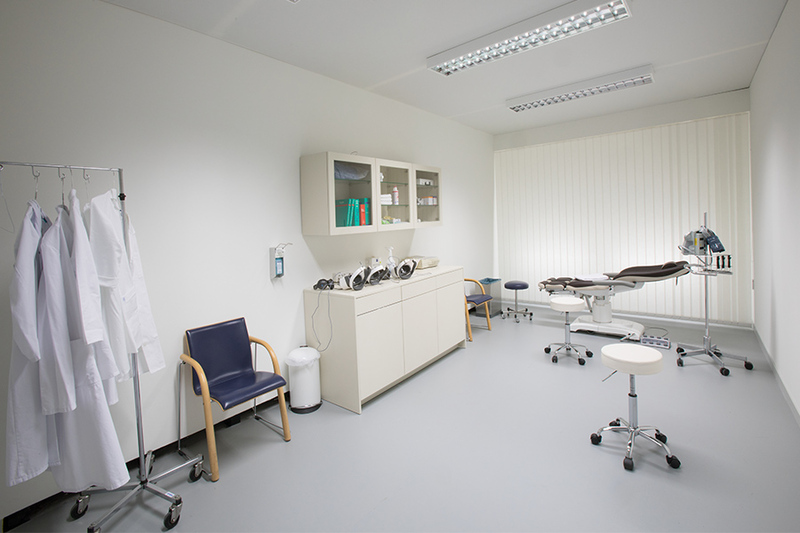 How is the detailed clinical setting and the sterile atmosphere connected with your film? If this film is about a disruptive break with the past, which results in a crisis on psychological and social levels, then the space where the work is installed alludes to a desire to cure this rupture. The experience of virtual-reality technology always reminds me of going to the doctor for a medical exam. If museum visitors can be described as sick people looking for a cure then art is, in a sense, both therapeutic and symptomatic of their ailments. „The Invisible Hand“ was created for an exhibition at the Guangdong Times Museum in China and is your first virtual-reality production. The audience is drawn into the events and experiences the story in a 360-degree view. What is it that fascinates you about this technology? And do you have plans for any more VR projects? The Guangdong Times Museum, which commissioned this work, is a large white-cube space situated on the roof of several residential towers on the outskirts of the city. Architecturally, it’s part of a residential community but otherwise it shares very little with its thousands of neighbours. My first idea for the exhibition was to show my works in a few of the museum’s neighbouring apartments. Visitors would be able to meet the museum’s neighbours and sit in their living rooms and bedrooms and see my work on TV. This idea was not feasible, so the alternative was to recreate the apartments immersively inside the museum space. The entire gallery space was architecturally transformed to precisely recreate the residential floor plan immediately below it. And the film itself begins in an apartment just below the museum. Why was the film banned by the Chinese authorities after just a few days? The official reason I was given was that there are no more ghosts after the founding of the People’s Republic. To make a movie about ghosts in a contemporary setting is to traffic in superstition, which belongs in the past and has no place in the present. And the moral of the story … Does your work also contain a moral message that you would like to communicate to the audience? Perhaps in the sense of the message „I will never lie again.“ And are you superstitious yourself? There is no moral in the work. The film tries to portray a society experiencing rapid transformation and the pressures it faces when its past is suppressed. And yes, I am superstitious.